X & Y axes are equipped with imported servo motors, X & Y are positioned by optical encoder and leading screw individually. 1) Advanced Media System for long unattended print runs. High Speed Digital Textile Printing Machine. Direct to fabric printing , Konika Minolta print head with 1024i print head. 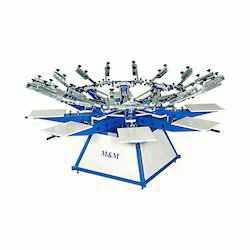 Our company is looked upon as one of the Screen Step & Repeat Machine manufacturers in India. Various industrial sectors are placing repeated orders for the Screen Step and Repeat Machine due to the excellent and efficient performance in respective applications. Our printing is equipped with machine printing machines specialized for Pigment, Plastisol, Reactive, Foam, Discharge, Non PVC, Flook, Glitter, Sticker, Tie&Dye, Combo Prints etc., which has capacity to produce 4, 000 impressions/day.